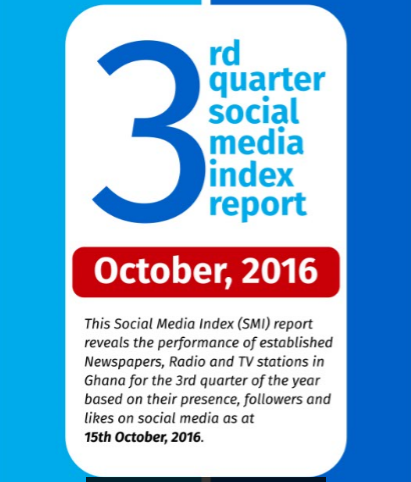 Penplusbytes has released its latest social media ratings on Ghana’s traditional media, revealing the performance of established newspaper brands, radio and television (TV) stations in Ghana for the 3rd quarter of the year 2016. 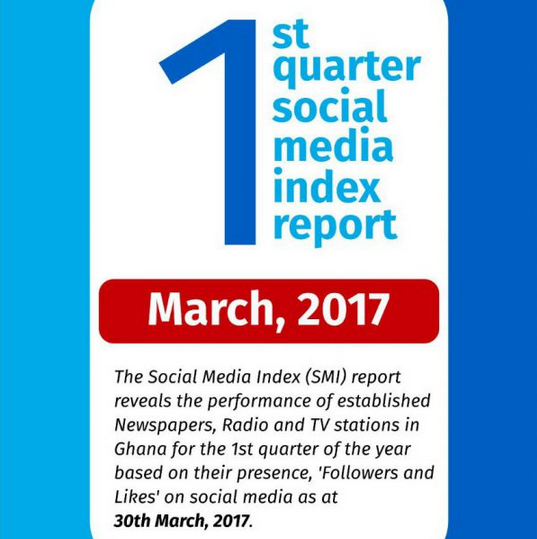 Premised on the same objectives as the 1st and 2nd Quarter reports, Penplusbytes’ 3rd Social Media Index (SMI) report reviews the outlook of various media entities in Ghana based on their presence, followers and likes on social media; particularly Facebook and Twitter. 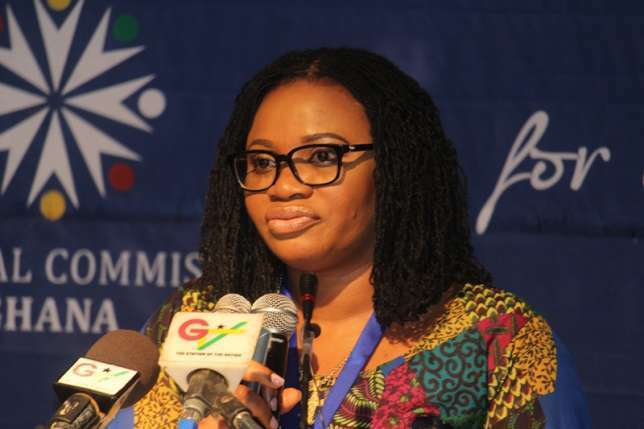 Assessing the activities and performances of well over 350 radio stations, 60 Newspapers and 34 TV stations in Ghana who are harnessing social media as a news generation and dissemination tool, the report lends credence to the status of Facebook as the most popular social media tool in Ghana with greater patronage than Twitter. It comes, therefore, as no surprise that there are more Ghanaian radio stations on Facebook (70) than there are on Twitter (39); as many TV stations on Facebook as there are on Twitter (23) and more Newspapers on Facebook (21) than there are on Twitter (8). 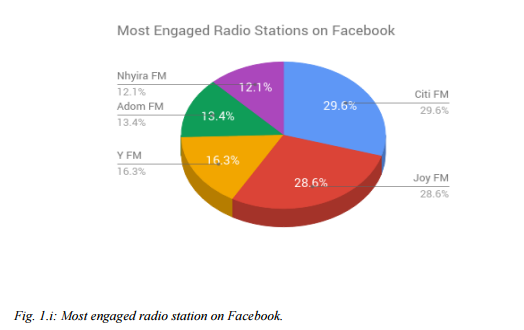 The report indicates that Citi FM has overtaken Joy FM as the most followed radio station on Facebook after losing the slot to Multimedia’s foremost radio station in the 2nd quarter report. On Twitter, Joy FM maintains its lead as the 1st ranked radio station; a position it has held onto since the beginning of the year. The report, which is downloadable here, provides detailed insights on similar indices for TV and Newspaper categories as well. 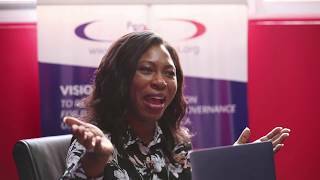 With data collected remaining valid as at 15th October, 2016, this report measures how Ghana’s traditional media utilize their online platforms to reach out and engage their target audience by employing a quantitative research module. The module provides relevant numerical figures which informs the rankings. 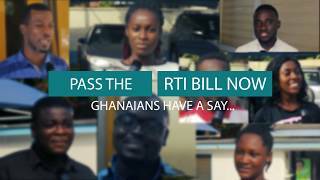 Kwami Ahiabenu II, Executive Director of Penplusbytes, said the report’s outcome highlights the general use of social media by the media and their newsrooms. “Traditional news sources – radio, TV and newspaper – have stricken an almost inseparable connection with new media techniques of which social media is key and this report serves as an indication of news organizations’ attitudes towards new media,” he added. Though social media’s influence is rising and hastening the spread of information and ensuring an increasing reliance of readers on online resources to provide information and news, there still seem to be a snail-paced transition to what is evidently an important shift from physical print towards online media. This report shows that though many media houses own various social media accounts, they have failed in the efficient and effective management of their accounts as many have been left without updates for many months and even years in some cases; thereby defeating their purpose. 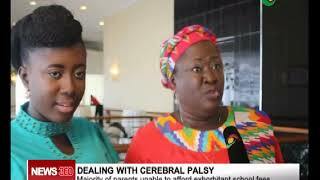 Only a handful of media brands run dedicated social media accounts with stations in the Greater Accra region holding on to their stake as owners of the most active and engaging accounts. The report reveals a key characteristic of media houses and their online activities in the lead up to the December 7 polls; how citizens, the media and political actors have utilized the tool to engage, interact and amplify voices on key issues around the elections. 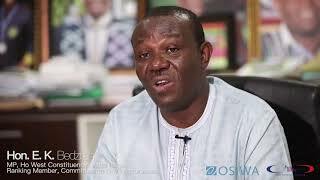 Beyond trademark writing and posting styles as well as hashtag uses, many media outlets, as part of their strategies to court maximum interest and following, and to better engage their online audience before, during and after the elections, have adopted Ghana elections themed account names prefixes on social media especially on Twitter and perhaps as indication of what their topmost priority issue within the period is. This phenomenon appears to have contributed to a surge in the general appeal the number of followers of media/news entities on social media. Joy FM’s Twitter account is prefixed by #ElectionHQ, Citi FM’s has #GhElections, Starrfm has #EIBElectionHub and TV3 has #ElectionCommand. These accounts unsurprisingly are amongst the best performing media entities on social media with the most up-to-date, interactive and best followed as revealed in the findings presented in this report.